Last time, Grandson, I started telling you about my first day in boot camp. This time, I’ll tell you about the time I was forced to take dive training. I couldn’t swim. 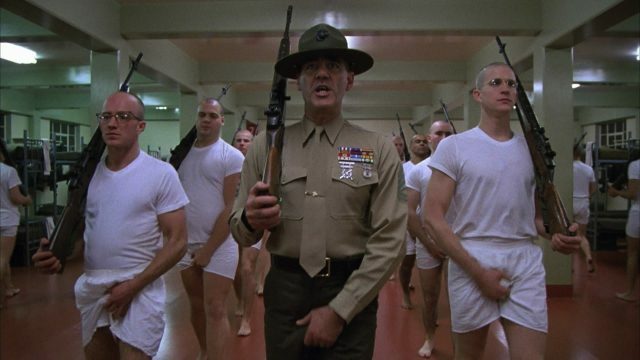 So, picking up where I last left off, here we are in our permanent barracks and this god-awful bellowing comes through the doorway from the hall: “You maggots are all alike, bunch of cry babies, crying for your mommy. Well, mommy has arrived.” In walks this short sailor in his white uniform, looking like a real-life Popeye, hollering at the top of his lungs. His rank was a first-class engine man, which meant an eagle with three stripes underneath and about five or six hashmarks on the lower part of his sleeve, each hashmark representing four years of service. He walked to the centre of the room, continuously hollering about “mommy this” and “mommy that” and saying that we were “a bunch of worthless pieces of sh…,” you can fill in the blank. He got us down on the ground doing push-ups and a few more choice words came out of his foul mouth. This was our indoctrination to the CC and this went on for about an hour. Finally, he had us at ease at our bunks and started talking to us in a halfway decent manner. He introduced himself as “EN1 William Estep US Navy”. He was giving us the lay of the land, what we were to expect for the next nine weeks. He told us all the things we could do, and all the things we were not allowed to do. There seemed to be more of what we couldn’t do than what we could. He asked how many of us had marching experience, and me and three others raised our hands. He asked each one of us what kind of experience we had and, of course, I told him I got experience from our athletic director in high school during two years of gym class. There was one other guy who had marching band experience and he selected him as our RPOC (recruit petty officer chief) – this is the guy who would march us as a company and call cadence for us to stay in step. I became a squad leader and was at the head of my squad. When we had certain duties to perform, we did them as a squad. We got to know each other really well. We were up at the break of dawn and in bed at nightfall. We would march to chow in the morning and break ranks in single file by squad. Most of our days were consumed with classes and marching, and of course lots of disciplining from the CC. Navy boot did not have a lot of physical exercise, but it did have a lot of psychological exercise – you know, messing with your mind. There were some special days where we would be put to the task – physically and mentally. There were three swim classes that we had to pass and pass well. Now, I am a boy from Kentucky and I wasn’t the best of swimmers; as a matter of fact, I couldn’t swim five feet…and you can forget it if I had to go further than that. So, here we are at this swimming pool, and I mean a big swimming pool. They marched us into this area and we changed into our Navy-issue swimming trunks, very classy trunks…not. They had us stand single file in front of this tower on the side of the pool and they said it was 30 feet tall. The instructor explained exactly what was expected of us. By the way, we were not allowed to speak at any time, unless we were spoken to. That applied to everywhere we went. He told me to climb the ladder. So, I climbed the ladder. When I got to the top and met the other instructor, I told him I couldn’t swim. He told me to jump in. I plopped into the water and made an attempt to swim around the pool and really wasn’t doing good at all. So, they pulled me out of the pool and sent me down to the other end of the pool where there was an instructor showing people how to swim. I walked down there and got into the pool and the instructor spent about five minutes with me, showing me how to swim and float on my back. I was doing pretty darn good. And then he told me to get out and go back to the tower and jump in again. I went back to the tower, climbed the ladder and jumped in, and swam all the way around the pool and turned over on my back and floated for five minutes. Hallelujah! I actually passed my first swim class. The next two swims were very easy and I passed them with flying colours. The next special class we had to go through was the gas chamber and firefighting. We were bussed off the base to a location about ten miles away. I remember the busses turning into this area that had about five buildings on it and some of the buildings looked burned out. Makes sense, it’s a firefighting school.